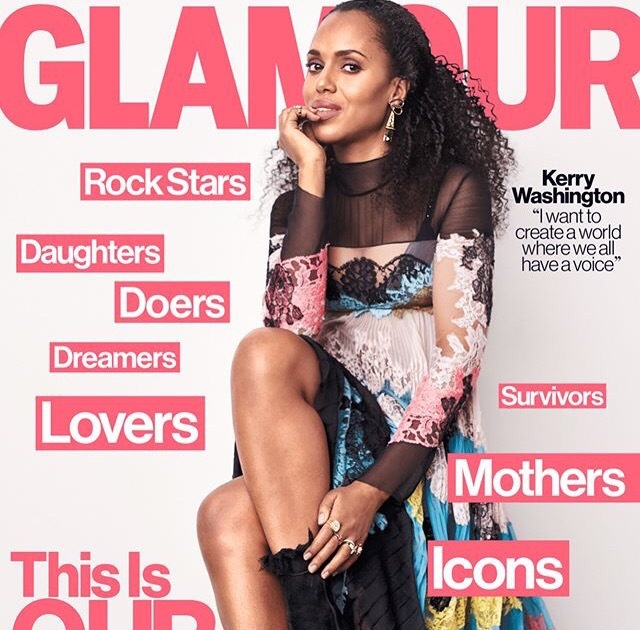 Scandal actress Kerry Washington is the cover of Glamour Magazine May edition, the month we celebrate our mothers, the mothers to be. Kerry Washington is a young mother. And she combines her motherhood with her many activities including acting and branding for brand like Neutrogena and OPI. For Glamour Magazine, Kerry Washington did an amazing photo shoot with crochet braids hairstyle. Olivia Pope did her 100 episode for the ABC TV serie Scandal. Kerry make some revelations regarding this last episode. She said that it was an incredible journey for her, a mix of fashion and wine. She had a celebration party with her team cast and let her followers involved in it with some posts. That 100th episode aired on April 13rd 2017 and there was a wedding scene with Liv walking down the aisle. Fans of Acandal will have more to come! Congratulations to Scandal cast team and ABC.